Salmon is a good source of vitamin D and potassium. 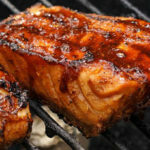 But if you are still not into it, this delicious George Foreman Grilled Salmon recipe might just be the perfect one for you to get started with it. Salmon doesn’t take a lot of time to be cooked. But if you want it to get nice grill marks you might want to keep it in the center while cooking. If you are worried about overcooking it you can always put it in the oven and finish right after getting those grill marks. Alternatively, some people like to lower the heat (e.g. medium heat) and cook it for a longer period. If you just want to get the skin nice and crispy you don’t need to flip it at all. Just make sure to get the skin side down on medium heat (with the lid on) while the top gets cooked in the heat contained in the grill. One drawback of this is the fish might be a little bit dry for you. If that’s the case, you can use a cedar board and keep it juicy with all the flavors in it. This allows the salmon to cook evenly without you having to flip it. However, keep in mind that the fish will taste completely different from a seared one. Some fish lovers use a different approach when cooking – wrap the salmon fillet in foil with all the spices in it and throw it on the grill on medium heat. After 20-25 minutes it’s done. This method is really handy when you are busy and just want to get the salmon done on the side. When grilling salmon, I usually like to oil it lightly before seasoning. This helps me flip the fish easily (Otherwise, they might fall apart). Although in general, salmon does get flaky when cooked. So it’s always a good idea not to flip too many times (It’s much easier with George Foreman 5-Serving Removable Plate Grill and Panini Press). Season salmon fillets with salt, pepper, garlic powder and mix it in a bowl with oil. Place fish in a large Ziploc bag and refrigerate for at least 2 hours if possible. Lightly oil grill grate so the fish doesn’t stick to it. 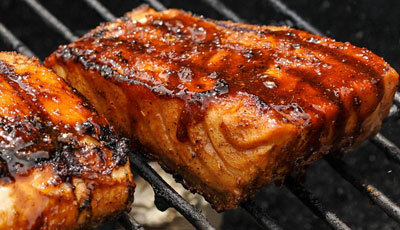 Place salmon on the grill. Cook for 8 minutes per side or until you get the desired doneness.